A few years prior to 1830, Greensborough was divided into three imaginary wards, known as “The White Settlement,” “The Black Settlement,” and “Dogsboro.” A diligent search failed to reveal the reason for the names. The reader is left to judge of the appropriateness of each by a description of the various wards. The boundaries of the White Settlement were from Centreville street on the east to the street immediately east of the Greensboro hotel on the west—in other words, the two blocks east from the hotel. 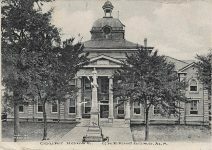 In this Settlement was a two-story frame hotel, painted white, located where the court house now stands. 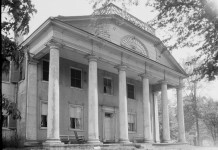 Opposite, was an imposing looking (for those days) frame house, the residence of Dr. Hunter. The house is yet standing, but has been added to in the rear, and is known as the Gewin hotel. 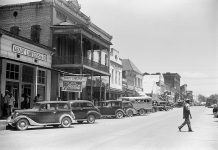 Further on towards the west, on either side of the street, were buildings variously occupied—two dry goods stores, in one of which was the postoffice, a tinner’s shop, a tailor’s shop, a lawyer’s office, a printing office and two dwellings. 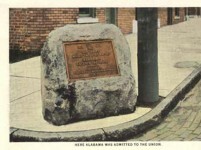 From the street east of the Greensboro hotel to Tuscaloosa street on the west was known as the Black Settlement. 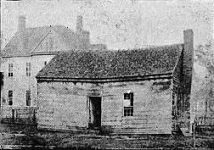 Within these limits were four or five dry goods stores, two liquor saloons, two lawyers’ offices and three dwellings. On the Powers’ corner stood a one-story double log cabin, kept as a hotel, its swinging sign a stag. 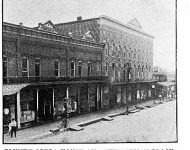 Scarff’s cabinet shop and residence stood where the large two-story brick store stands at the corner of Tuscaloosa and Main Streets—built in 1887 by Capt. S. T. Taylor— by the way, the first brick structure that had been erected in the town long before the civil war. Opposite the Scarff building was a red frame house, a hotel, kept by Maj. A. L. DesCourt, a French refugee, who had served under the first Napoleon, and participated in the battle of Waterloo; further up, on the same side of the street, was a store and a tailor’s shop. 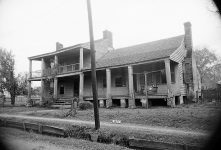 Dogsboro extended from Tuscaloosa street on the east to the Stollenwerck old homestead on the west—the western boundary line being the corporate limits of the town. In Dogsboro stood the village blacksmith shop (Coleman W. Garrett, proprietor). 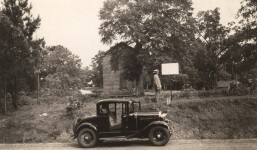 It was located near the west corner of the present Methodist church lot, about as far back from the street as the church stands. 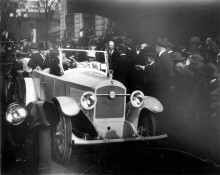 The passage of the years and the earnest endeavors of good people work wonderful changes. The progress of civilization is to be noted by the churches and Schools along the pathway. 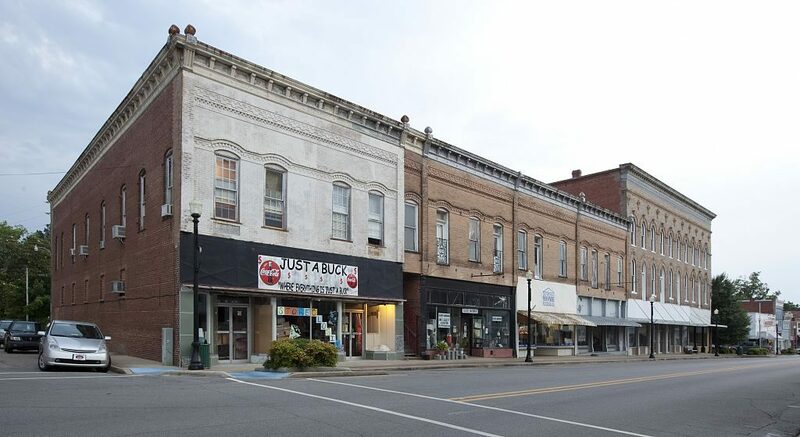 Back in the days referred to, when Dogsboro precinct was in its glory, near where stands the Methodist church was a two-story frame store, which was used from 1833 to 1836, at the time of the races, as an open gambling house. 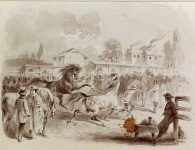 It was filled with faro tables and gambling devices of many kinds, and the visitors to the place were numerous, and large sums were lost and won on the result of the races and around the gaming tables. The officers of the law paid no attention to such diversions, and gambling and horse-racing went on undisturbed. 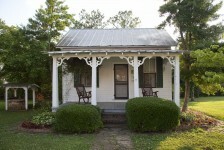 This house was occupied for a few years after 1836 by Levin Gayle as a dry goods store. 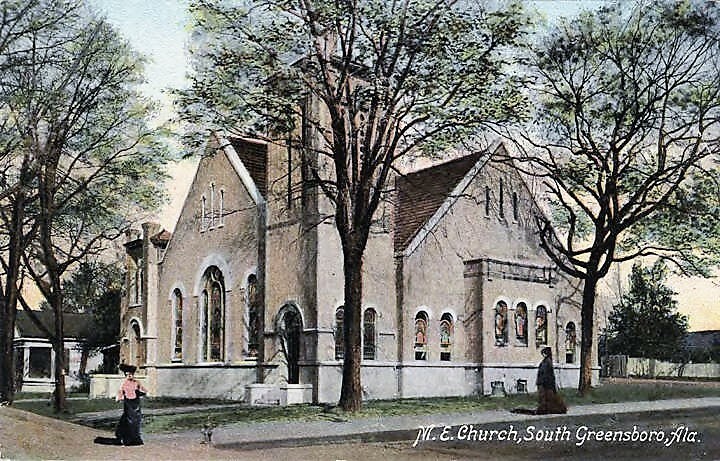 In 1839, the lot was sold to the Methodists of Greensboro, and a church was erected thereon the next year.